Rauhah's finally weaning off! Yeay!! It didnt happen naturally of course. I decided it's about time when it started to sting me whenever she latch and I couldnt bear it anymore. I told her she cant have her bak anylonger because she is big enough and she could have drinks from her cup if she is thirsty. Of course it always ends in tears everytime she wants it but I always hug her tight and clench my teeth so that I could bear the tantrum. Haha. I made up the story of course! Kalau tak, payah la nak distract oii. Macam2 dh buat cerita but she buys that one the most. Hoho. So the nightsleep always ends her in my arms where she would cuddle until she falls asleep. We had our pillow talk in pitch black and she slowly dozz off. It such a wonderful feeling when she does it without tears and I could feel she is happy before closing her eyes to bed. Nowadays, she dont need the story and pillow talk anymore. When she needs to sleep, she just take my arms wide open to cuddle, then fall asleep in no time. Ok now, please excuse us. We have a graduation ceremony for our Master in 2 years of breastfeeding. Salam Aidiladha everyone! We didnt balik kampung this time around. I was disappointed when Husband decided to Raya at home and I literally praying that Allah soften his heart so we could celebrate it either Kuantan or Besut. I also prayed that we dont break our parents heart and soften all of our heart as well, including myself. I dont get his idea of wanting to rest at home during festive season - Raya kot!! I wanted to argue but I kept silence because we always balik kampung pun lately and in few weeks time nak balik lagi. I understand that he became restless of travelling every weekend but he can also have his rest at kampung kann. This is the man part that I dont get. Husband wasnt the type of saying he miss us whenever he's away but he suddenly did this time around. So basically we are at home on Raya for the first time ever! It still felt like normal Aidiladha even we are away because PIL decided to stay overnight a day before Raya, bringing the goods from kampung - rambutan and dokong. Such a blessed! Plus, our closest neighbour was around. They had makan-makan and I already feel like a family when spending half day at theirs on the first Raya. The next day was at Zac's where we makan banyak gile. Tak tipu dan tak malu. Haha. Siap tak puas rase nak buat lagi sup daging esok tapi mengenangkan daging pasar ni, trus mati selera. Tapi tetiba rezeki datang dari jiran bg daging korban. Whoa.. That silent prayers. 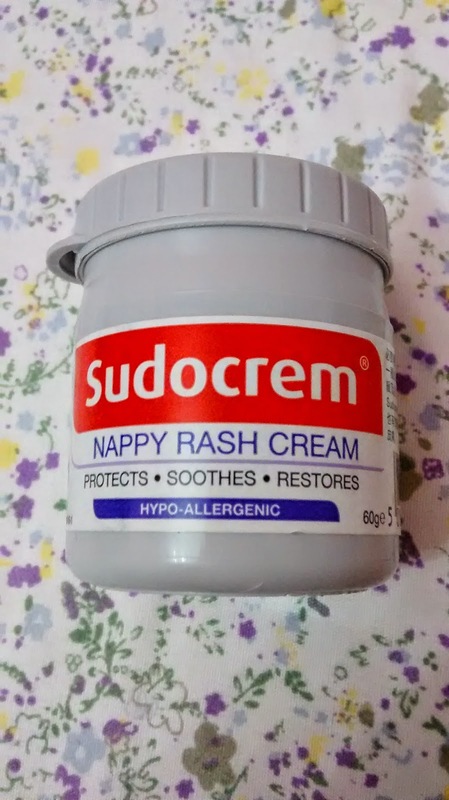 Umur dah 2 tahun pun kene nappy rash lg ey. Rauhah hardly had nappy rash and as far that I remember she only have it not more than thrice. Tapi lately tetiba wujud pulak. Probably sebab die banyak membuang sampai naik ruam. At first I applied Pureen Medicated powder tu tapi tak nampak macam nak reda je lepas 2 days. Time ni terus teringat ubat mujarab that I got it for free from PCMC goodie bag lepas discharge from Rauhah's delivery. I bought it from Guardian and they dont have smaller size. Lgpun malas nak cari tempat lain sbb dah tengok dekat Aeon Big and Giant tp xjual. I know that Mothercare sold this type of brand too. Probably you can check it out there. Kalau boleh beli size kecik je sbb this cream really works after the first apply. Tak sampai sehari, rash Rauhah dah hilang. Sapu nipis je. Kalau botol kecik tu memang tak terpakai. The one that I receive for free to pun dlm brape gram. Tu pun I throw it away sebab Rauhah pergi contaminated dengan bendasing. Hoho.